3AM Friday morning, BOOM! Honestly, I did not want to deal with it, but SO got me out of bed saying I need to see this. Saw the gaping hole in the ceiling first. And then the Huge mess underneath. The living room furniture was buried under ceiling dry wall and a nasty mass of wet, pink insulation. And water drip, dripping from the edges of the hole. What do you do?? It's still raining outside. Start moving things out of the way (nothing broken, everything wet, futon cushion ruined, tv and stereo escaped, unscathed) and then go back to bed and start worrying about what's going to happen. I did go to work, Friday morning, for a half day. Told everyone what happened, they said, oh my god, why are you here? I told them there was nothing I could do at home. But as the morning went on, I was just working myself into a panic about what was going to happen. I thought that we would have to move out of our apartment. I was so stressed out, and glad to leave work at 11. Drove up to the apartment and they've got the carpet people working on our living room carpet. The hole is patched up with plastic, as you can see in the photo above. 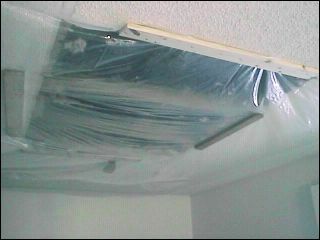 Apparently, they got the roof fixed right away and they'll be fixing our ceiling in a few days, as soon as things dry out. I was utterly amazed. And so relieved that we don't have to move out. The apartment people set us up with a motel room while our apartment dries out. It's a decent motel, and some time away from the computer is proving fruitful. Last night, I was able to read more and write more than I normally would in a whole week! Unfortunately, living in such close quarters with my partner makes me rather short tempered. I already owe a couple of apologies, and it's just been one night and one morning. oh well. Good and bad, no matter what life throws at us, huh?